I’m getting ready to do a series of posts on cleaning a coffee maker and it occurred to me that the average person probably doesn’t know how much vinegar it takes to clean a coffee machine (or coffee pot). Vinegar is widely accepted to be one of the best natural acidic cleaners for hard water stains and mineral deposits. Unlike harsh chemicals vinegar leaves behind a perfectly safe residue and odor that can easily be rinsed away with plain cold water. If you live in areas with hard water you are going to need to use more vinegar to clean your coffee pot than people who live with soft water. Spring water or well water users may also need to use more vinegar due to higher amounts of minerals in the water. >> In fact, high minerals in the water can make it hard for vinegar to fully decalcify water lines so I’ve got a list of alternatives here for you here. Avid coffee drinkers are also going to need to use a bit more vinegar than occasional drinkers will. This is because they are more likely to care about an untainted flavor and because they are using their machines more often and therefore making the insides of the machine dirtier faster. 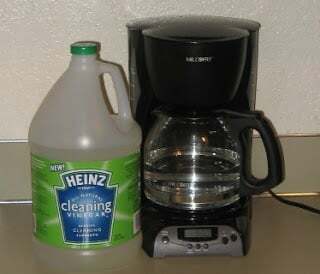 If you have a 12 cup coffee pot then you will want to use 4-6 cups of white vinegar to 6-8 cups of plain water. If you haven’t descaled or cleaned your pot in a long time (think years if ever) then just use a bit more and repeat the cleaning process to help loosen up the gunky buildup. If you are ambitious it’s good to lightly clean your pot every month or so but you can certainly do it less frequently than that. If you do intend on cleaning your machine monthly then you should be able to get away with doing a 1-2 mixture of vinegar to water ratio and maybe even 1-3 in places with soft water. In any event cleaning your coffee machine is very simple and the cost of white vinegar is negligible so it’s worth doing more frequently than every couple years. In future posts I’ll be breaking down more questions people have about cleaning coffee pots and then eventually posting a big guide on the topic. In the mean time feel free to keep reading for elaboration on this topic. Here are some different ways to descale your coffee maker. Imagine this: You woke to a good day. You had your day planned out. Everything seemed to be working your way. It’s time for a good cup of coffee to jumpstart your exciting day ahead. You prepared your coffee maker and got in going to brew. You went for a shower, got dressed. Now, you sat down for a quick breakfast with your much-awaited morning drink. After a sip, you took a hard look at your cup. Something is definitely not right. You took a second sip. Definitely, there’s something wrong. Your coffee taste bitter, odd. When you have been using your coffee maker for quite some time, you know the quality of the coffee that it can produce. If you notice that there’s a sharp change in the taste of your everyday morning cup of Joe, it’s a warning. You need to act fast. When the coffee you brew starts to taste bitter and funky it’s time to give your coffee machine a little extra love. A simple cleaning will help maintain freshness, remove hard water spots from the carafe, and prevent staining. It will also remove mineral buildup and clean out the coffee oils that get left behind and turn rancid. How Did the Coffee Maker Become Dirty Anyway? Any equipment requires cleaning. That’s a fact. Coffee maker requires more attention. If you carefully look into the process and mechanism of coffee maker, you will begin to imagine that several parts of the coffee maker can be home to molds and bacteria. It’s always wet. Water is the second important ingredient of coffee brewing. This means the coffee maker is always wet. A moist environment is the birthing pod of bacteria and molds. If this gets into your cup of coffee, you will end up sick. The idea alone is enough to make one gag. Calcification can occur. Water carries minerals. Over time, these minerals can build up and form scales inside the coffee maker. This will make your coffee sour. Coffee drippings will stain the hot plate. Once you remove the carafe, there will be drippings from the filter and it will stain your hot plate. This will leave ugly, blackened spots on the plates. The carafe itself will have stain. Coffee has a strong color that can stain any surface if constantly exposed to this liquid. According to Good Housekeeping, using a vinegar is one of the easiest and quickest way to clean a coffee maker. Here is a simple step-by-step guide to use vinegar when cleaning your coffee maker. Also note how much vinegar is needed to clean your coffee maker. Empty the carafe. Remove all contents of the carafe and rinse it with water. Make sure to dump out any coffee ground left in the filter. Mix equal parts of water and white vinegar. As a rule of thumb, fill half of the carafe with white vinegar and add water to make it full. Run a half brew cycle. Start a brew cycle. When halfway through, turn off the coffee maker. Let the solution set for an hour. This will soften any build up and stain in your coffee maker. Complete the brew cycle. After an hour, turn on the coffee maker and finish brewing. Discard the water-vinegar solution. Make sure to discard all of the water-vinegar solution. After this thorough cleaning process, it’s time to check on your coffee maker. Brew a fresh cup of coffee. If the uninviting taste occur, maybe it’s a good time to change your equipment.